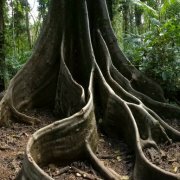 Journey with a "mad scientist"
The Daintree Rainforest is the oldest, continuously surviving rainforest containing the greatest diversity of plants and animals found anywhere in Australia. 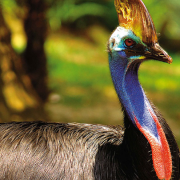 It plays host to 13 of the world’s 19 primitive flowering plant species and is home to 28% of frogs, 65% of ferns, 40% of birds and 34% of mammals in Australia. Covering an expanse of more than 1,200 sq km, the landscape is diverse and the coastal scenery extremely rare; combining tropical rainforest, white sandy beaches and fringing reefs just offshore. This special area is the only place on earth where two heritage listed areas meet side by side - the reef and the rainforest. With magnificent scenery, mountain ranges, fast flowing streams and waterfalls, deep gorges and dense rainforest, it is a sight not to missed on your holiday itinerary. Mossman Gorge is located just 20 minutes by car north of Port Douglas and is the gateway to the World Heritage Listed Daintree National Park. 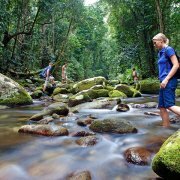 Renowned for its crystal-clear waters that cascade over granite boulders, Mossman Gorge in particular, is a must on the holiday itinerary for most visitors. The Eastern Kuku Yalanji Aboriginal people are the Traditional Owners of this area, with their tribe dating back some 50,000 years ago to the earliest human occupation of Australia. They are the only aboriginal tribe in Australia who still have their own language, and describe themselves as true rainforest people who live in absolute harmony with their environment.In pre-contact times, the Kuku-Yalanji subsisted by preparing rainforest fruit and plants (nutritional and medicinal) capturing scrub turkey, fish, honey, possum, eggs, tree kangaroo, fresh water shrimp, eel and seafood such as mud-whelks, turtle eggs, 'pipi' and fish etc. 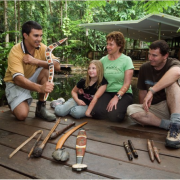 Today, the Kuku Yalanji people retain strong traditional connections to this World Heritage listed Area, they play a very important part in the protection and maintenance of the Daintree. The Mossman Gorge Gateway Centre is a new Indigenous eco tourism development that features a contemporary café, art gallery, gift shop and tour desk. Staffed by local residents, it offers the opportunity to learn about the rich cultural heritage that links the people of the region to the land. 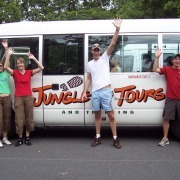 An eco shuttle bus service departs every 10 minutes from here, transporting visitors into the heart of Mossman Gorge for a small fee. This service was developed to reduce the high amount of tourist traffic entering the gorge, and to ensure the protection of this significant landmark. 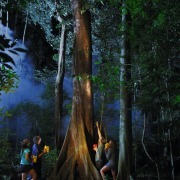 The Ngadiku Dreamtime Walks are a wonderful opportunity for visitors to connect with the local Rainforest Aboriginal people. Conducted by a local Indigenous tour guide, the walk will take you on a journey along private, gentle tracks, visiting special places and culturally significant sites. 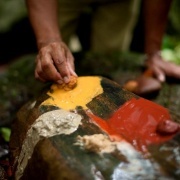 Hear first-hand from the Kuku Yalanji people the creation stories and history that are steeped in the roots of this ancient rainforest. 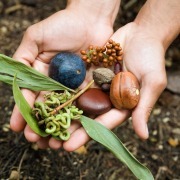 Learn about eating bush tucker, using plants and animals for curing sickness and disease, traditional and contemporary ways of looking after the rainforest and the importance of this for enriching the livelihoods of the Eastern Kuku Yalanji people. 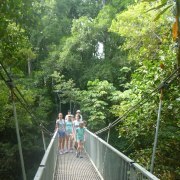 Choose from a 1.5 hour or 2.5 hour fully guided walk, or enjoy as part of a full Daintree Rainforest experience. 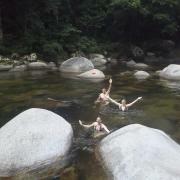 Mossman Gorge features extensive walking tracks, a day use area and the opportunity to take a cool swim in the refreshing waters. 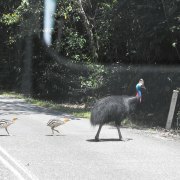 The range of habitats in the Mossman Gorge section of Daintree National Park supports a diverse assortment of wildlife. Butterflies are among the most commonly seen animals. Look for the brilliant, metallic-blue Ulysses butterfly and the striking black and green male Cairns birdwing butterflies along the walking tracks and near the river. Mossman Township itself has been a rural centre for the sugar cane industry for many years. 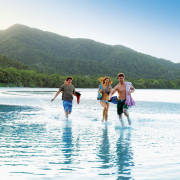 As the last main town before the Daintree River, it provides a service centre for people heading North. 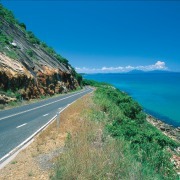 From Mossman it is approx a 20 minute scenic drive north towards the Daintree Ferry turn off. 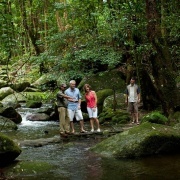 If you carry on straight you will arrive at the small artful township of Daintree Village. This township is home to only about 100 people and it is very laid-back with a country feel. 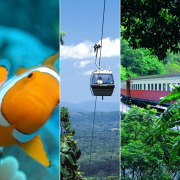 Set in the midst of some of the loveliest and most varied scenery in Far North Queensland, Daintree Village hosts a number of restaurants, artists' studios, locally-created souvenirs and picnic areas. 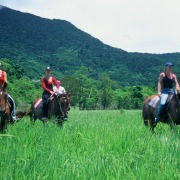 The Daintree River flows past the Village, and the surrounding hills and valleys provide pristine agriculture pastures for cows to graze. 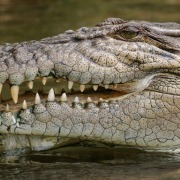 The Daintree River is home to many estuarine crocodiles and an abundance of birdlife endemic to the Daintree Region. 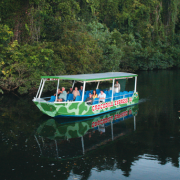 Croc spotting and birdwatching tours depart daily from various locations along the banks of the Daintree River. A river cruise provides superb wildlife viewing opportunities, with an average of 40 birds and animals sighted on each tour including crocodiles, snakes, and rare birds. 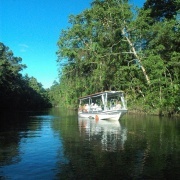 Cruises are provided in a small vessel which enables an intimate exploration of the river banks and wildlife in the trees and sky above. 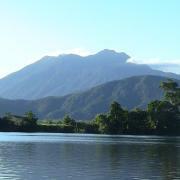 The north and south banks of the Daintree River are linked by the Daintree Ferry. 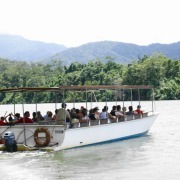 The Daintree ferry is the only cable ferry operating within tropical Australia. 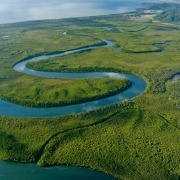 It makes continuous crossings of the Daintree River throughout the day, which takes about 5 minutes to cross the river. 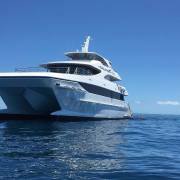 A fee is payable to use the ferry service prior to boarding. The ferry operates 6.00am until midnight every day with a reduced service on Christmas Day. Cape Tribulation is a headland that juts out into the Coral Sea; named by Lieutenant James Cook after his ship, Endeavour, was holed on a reef in the area in 1770, it was here he penned that his trials and tribulations began. 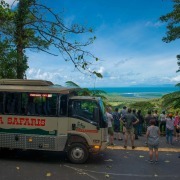 The Cape Tribulation section of Daintree National Park begins just over the Noah Range. You can capture great views of the Cape Tribulation headland and fringing reefs as you descend from the Noah Range into the Cape Trib valley. 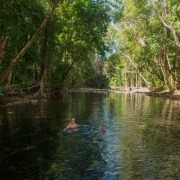 Cape Tribulation extends north along the Bloomfield Track as far as Bloomfield River. 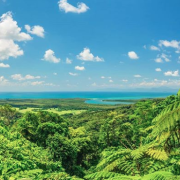 Surrounded by national park, visitors can enjoy bushwalking, night spotting for wildlife, a variety of rainforest adventures and exploration of the fringing reefs. 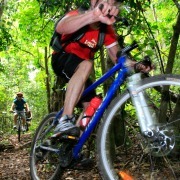 A small tourism hub is centered around Cape Tribulation with shops and a small number of services. The beach is very popular for day visitors where you can view the fringing reef and exactly where the reef meets the rainforest. 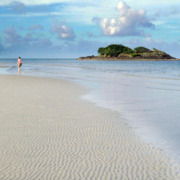 A beautiful long beach walk links Myall Beach and Cape Tribulation Beach. The view from the southern side of the Cape is spectacular. 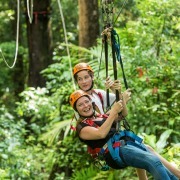 Jungle Surfing Canopy Tours are unique rainforest tours where you fly through the trees on flying fox ziplines, stopping at 5 tree platforms to take in spectacular bird’s eye views over the treetops. 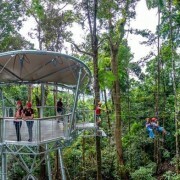 On each platform, a guide will greet you, connect you safely to the tree, and introduce you to different elements of the forest before sending you on your way to the next platform. The guides completely control your gentle flight, leaving you free to take photographs or just take in the views. 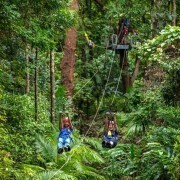 This is an adventure activity for all ages; it's safe, it's fun, and fully guided with no experience necessary. 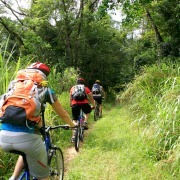 Cape Trib Horserides will lead you on a trail through cane paddocks and ancient rainforest, crossing streams and onto spectacular Cape Trib Beach. 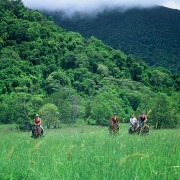 Cape Trib Horserides caters for beginners, intermediate and experience riders on a group of very friendly, well trained horses and is the only horse riding available in the Cape Tribulation area. Maximum of 12 people per ride. You must be 13 years or older. No experience is necessary as there are horses suitable for all grades of riders. Guides can give you help along the way if you are a beginner so don’t be afraid to ask.